Many second books fall prey to the “sophomore slump,” falling short of the expectation built up by their first book. 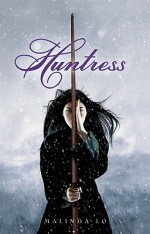 Happily, Malinda Lo has managed to avoid that particular issue in Huntress, due out from Little, Brown in April. This new offering is a companion piece to her debut novel, Ash, and takes place in the same world, but hundreds of years earlier. Huntress is a well-written, tightly plotted novel with interesting, engaging characters and a good balance of romance and action. Lo also paints a wonderfully egalitarian world in terms of sexuality. All romantic relationships are treated equally, and Lo is clearly comfortable writing both gay and straight characters, lending an authenticity to both the characters and the world they inhabit. The plot centers around two seventeen-year-old girls, Kaede and Taisin, who fall in love while on a perilous journey accompanying the king’s son, Con, to meet the Fairy Queen. They are chosen for this quest because Taisin has had a vision that it will be so. In the vision, Taisin feels a powerful love for Kaede, but in reality, the girls barely know each other. While their relationship progresses naturally and realistically over the course of their journey, one question remains in my mind: Would Taisin have fallen in love with Kaede if she hadn’t already felt those emotions in her vision? That is an underlying theme throughout this book: Do we choose our own fate, or is our destiny set out for us at birth? Early on, Kaede and Taisin are present at a meeting with the king and the head sages of their school. Kaede’s father, who is the king’s advisor, argues one future for her, while the sages argue for another. Kaede insists that she choose her own fate, but her decision inevitably leads her to forge ahead alone, leaving Taisin and Con behind just as Taisin foresaw. Does that mean Kaede’s fate was preordained? Or was it her choice? The same questions apply to Taisin’s love for Kaede: Did Taisin’s vision open her heart to the possibility of love with Kaede, or would she have developed those emotions regardless? While there is no clear answer, the book raises interesting questions on the subject. One qualm: The journey to meet the Fairy Queen and the subsequent quest is spread across most of the book. When Kaede is sent on a second quest, it takes only ten pages. This felt rushed and could have been saved for a sequel. As a whole, Huntress is a great story, one worth reading with pleasure. Lo is a real talent to watch across the GLBT, fantasy, and YA genres, and readers will look forward to future books. Lauren Hougen is a production editor with St. Martin's Press and an aspiring author. She is an avid reader, particularly of YA fiction, and has so many books that she has a storage facility to house them. Would you recommend reading Ash first, or can you dive right into Huntress? @Zoraida: You can read HUNTRESS first! I did, and it was completely understandable. Huntress is an amazing book! It’s unfortunate there isn’t a sequel, but one can still hope!